I hope that everyone is at home spending quality time with their family. I’m so thankful that I was able to make it home for the holidays. Like I’ve previously mentioned, this season is my favorite time of the year because everything is just so magical. Also, it’s currently snowing, which makes everything seem a little brighter and gets anyone in the mood for holiday cheer. During the holidays, many students, interns, and professionals practicing music therapy may have to explain music therapy several times to family members and friends. Thankfully, my family is extremely educated about music therapy because they have done research themselves and they were the ones who introduced me to music therapy in the first place; when they don’t understand something, they typically ask me about it, but I never have to give the elevator speech during the holidays. I know that many other students or interns may have to give several elevator speeches regarding music therapy, but I view this as a great way to practice advocating for our field. Even though it may feel frustrating at times for some people, it’s so important. Telling people, including family, about music therapy can spark questions and even encourage them to look up research. If that happens, then there are more people to advocate for music therapy and we all know the benefits of advocation. I know that when people ask them what I’m studying in school/doing now, my sister, mother, and father all tell them about music therapy in an educated and understandable way. I don’t have to explain music therapy to any family members anymore, but I still like to think of the holidays as a great time for music therapy advocation while spreading holiday cheer. That being said, my goal for 2017 is to always advocate and never feel frustrated about explaining music therapy to people multiple times. Music therapy is such a wonderful field and I know that I want to share the greatness with everyone else. I hope everyone has a great weekend and a fantastic New Years! I keep a detailed planner with all of my sessions and lessons outlined in a clear and colored coded way. I use google calendar, which has been a giant lifesaver during my internship. I print out a copy of my schedule every week, especially since it can change frequently and put it into my clinical binder (where I take data, etc). I also have a paper planner too (in my opinion, you can never have too many planners!). Both schedules are color coded to differentiate between sessions, lessons, hospital time, and even my own personal life including my job. Looking at my schedule immediately reduces any anxiety I have about my day. I make a weekly to-do list of everything that I want to accomplish that week and then I divide up those tasks for each day. Doing this makes everything more manageable. Someone once told me in college that it’s unrealistic to accomplish more than six tasks per day on top of every day life. That being said, I always make sure that my to-do list only contains six tasks and I only add more tasks to my to-do list if the tasks already on it are small and don’t take too much time. I keep a log of every activity that I do in order to make sure I’m on track and managing my time well. For a music therapy internship, it’s required that you keep a detailed log of daily assignment work and clinical hours. Although I have to do this, I’ve found that it helps to determine how I’m spending my time, evaluate, and then change it accordingly. I can see how long it takes to me to complete documentation or an assignment; if it’s taking too long to complete something, I can determine the reason and then work on being even more efficient. All of these activities help me get through my day. As I transition into a professional music therapist, my schedule will become even busier, but now I feel like I have the right tools to make sure I’m organized and practicing good time management. It has been a crazy week; so many unexpected events have happened in the past five days that I’m extremely happy that this week is now over. Even though some bad events occurred this week, some great ones happened as well. Also, despite everything else, I have learned some valuable life lessons that can be carried over into my clinical practice. Enjoy every moment that life gives you because something can happen and it can be taken away from you in a split second. This is the biggest lesson I’ve learned this week and I believe that it’s very important. Life can be taken away from you at any moment (sorry, it’s true) and it’s too short to be worrying about the small stuff. Enjoy every moment of life, the good and the bad, no matter. I don’t want to look back at my life and only remember the things that I spent hours worrying about because that would be a waste of my time and energy. I want to look back at a life that I’ve lived happily, to the fullest, and surrounded by those who mean the most to me. Sometimes things just don’t go as planned, no matter how much we plan or prepare. If you’ve read my previous blog posts, then you know I’m a planner and not planning so much is something that I’ve been continuously working on as well as not over thinking everything. Well, this week threw me some situations that were definitely not planned, and no matter what, could not have been avoided. I had to remain flexible throughout the entire week and realize that my plan was not happening. Sometimes, it’s like that in sessions as well. I may have a plan of interventions, music, etc. and the client will come in needing something completely different. That’s were flexibility is key; I throw out the plan for the day and just meet the client were they are and hear/listen to their needs. Things happen and it’s all going to be alright. Things happen by surprise every day and I’m so incredibly thankful for those in my life, my health, and this internship, which is helping me in ways that I didn’t even realize I needed. Even though some bad events may occur, it will always be alright and the bright side of life will appear again. For me, next week will be better and I will continue learning, growing, and celebrating this wonderful holiday season. This week in our series we are talking about music signs! 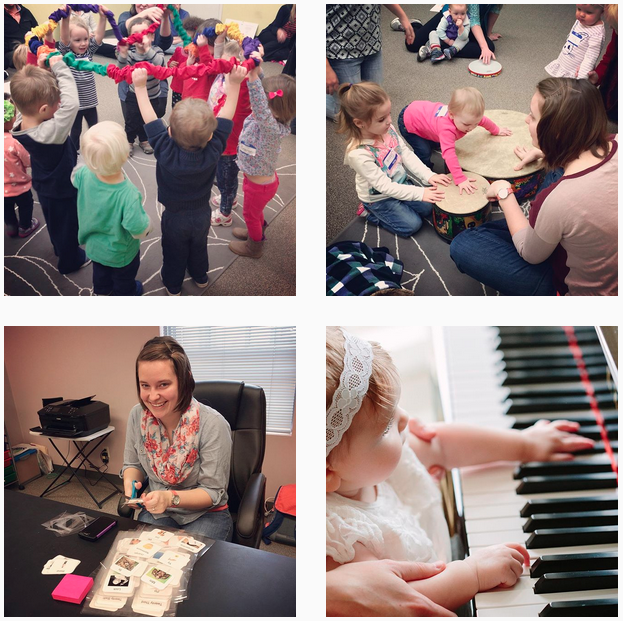 We have everything from music, play, stop, listen, and wait… to of course the sign for music therapy. As a music therapist these are signs I use all the time but these can also be great for teachers and paraprofessionals as well! Signs like wait, stop, and listen are key signs to know if you work with children and young adults. Offering a sign in addition to verbally asking the child to stop offers a visual prompt. This is just one more way we can adapt small things we do everyday to help all of our clients and students have more opportunities for success. Check out this week’s video and stay tuned for more signs next week!